The expression Speed to Fly represents the adjustments to a Paraglider's speed in relation to wind, lift and sink. Maximizing glide based on this relationship is a constant process while flying. Speed to Fly is a key that not only makes you a better pilot, but helps build a connection between you and the wing. This article was written to provide the basics of Speed to Fly and techniques to adjust your speed based on these variables. There are tools that you can use (speed rings on variometers or GPS systems), but not all pilots have these included in their gear. Besides, learning to fly without instruments is a large part of growing as a pilot. Learning to adjust Speed to Fly continuously while in flight can be done with some simple observations. If you want to learn the math part of the equation, many articles teach about Speed to Fly by using a polar. The math part of the equation works for some, but not everyone is good with numbers or looking at graphs. It's important to learn the theory, then practice making adjustments to hone a full understanding. Having a solid understanding of Speed to Fly will help you fly higher, stay up longer, and improve your senses of wind and lift. The basics apply equally to ridge soaring or thermal flying. The main factors that affect Speed to Fly are only two: relative wind direction and lift or sink. Next, you need to learn why each of these statements is true. In each of the below descriptions, eliminate the secondary set of variables and imagine that there is only one. For the wind descriptions, assume there is 0 on the lift / sink components and for the lift / sink descriptions, there is no headwind or tailwind. This is perhaps the easiest of these to grasp. In still air (no wind and no lift or sink), most Paragliders get their best glide at or very near trim speed. For simplicity, let's say that the sample Paraglider flies at 20 MPH at trim. In general, I like to promote that for any headwind above 12 - 15 MPH without lift, your best Speed to Fly will be most to full speed bar. This is very easy to see in a stronger wind situation. Picture yourself at 100 feet above the ground, pointing straight into a 20 MPH headwind. At trim, you will hover downward toward the ground at the sink rate your glider gets at trim speed. You will land on the exact spot beneath you. If you fly any slower, you will fly backward. If you fly faster (pushing on a speed bar), you will improve your glide by moving forward. You will in fact descend faster because of a slight increase your sink rate, but the factor of forward motion will be a greater. A slight headwind is not quite as easy to picture. Imagine yourself at 100 ft above the ground, pointing straight into a 5 MPH headwind. Flying slower will shorten your glide path. Flying full speed will also shorten your glide path. To maximize your flight path, about 25 to 50 % of the speed bar would be close. Note that in lighter headwinds, the difference in glide is not nearly as significant into stronger headwinds, but it is significant nonetheless. I recommend that up to about a 5 MPH headwind, trim is close enough to be acceptable. Keep in mind that the speed ranges I am discussing are generalizations and not correct for all gliders. * Fly at Trim in no wind or very light headwind situations. * Fly at full Speed Bar in any wind above 12 or 15 MPH. * Between 6 and 12 MPH wind, the speed bar will be pushed progressively. 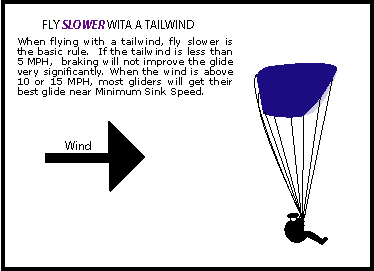 This is very similar to the above, but instead of accelerating as the headwind increases, you will fly progressively slower as the tailwind is stronger. Here, Min Sink is like full speed bar in the above "headwind" scenario. Other than in a flair, Min Sink is as slow as you should ever fly in a Paraglider. In any tailwind above 12 or 15 MPH, you will likely get your best glide by flying at Min Sink Speed. Because of the extra 12 + MPH groundspeed you will have over your airspeed, time spent in the air gains you more distance. 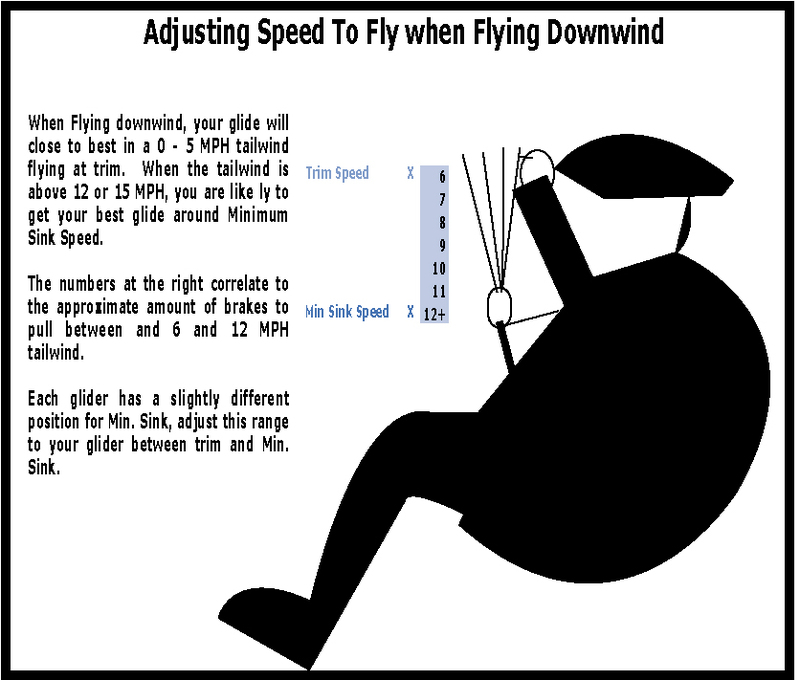 The combination of your slowest descent rate and the high groundspeed (Windspeed + Airspeed) will help your glide the most. Since minimum sink speed maximizes the time you are in the air, flying slower helps you fly the furthest with a tailwind. Most gliders get their best glide in 0 wind at or very close to trim speed. 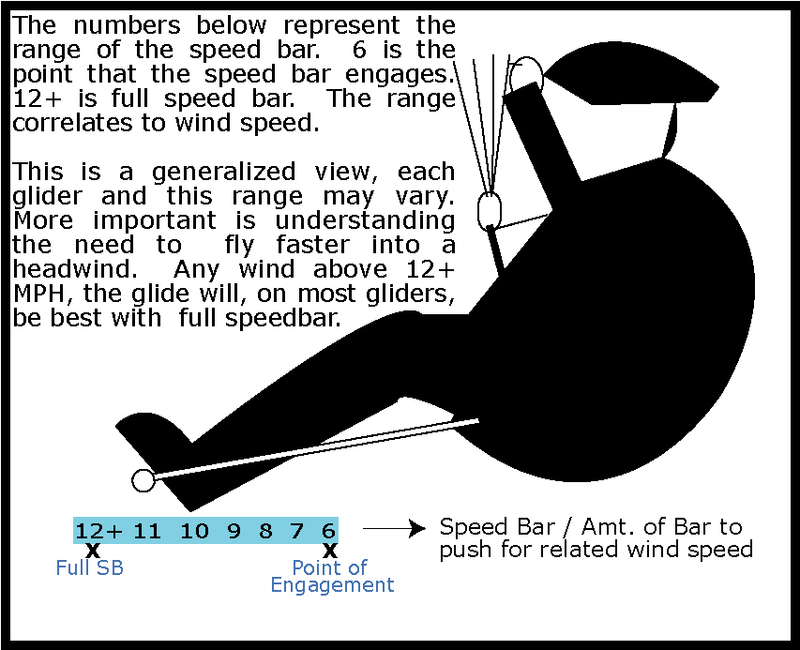 With a 12 + MPH tailwind, most gliders will get their best glide at or very close to min sink speed. In a very light tailwind up to about 5 MPH, there will not be a very significant improvement in glide by adding a little brake. But, in winds above 5MPH it will begin to become much more significant. So between 5 and 15, you will fly progressively slower between light braking at 5 to min sink around 12 or 15 MPH tailwind. The rule with lift is pretty clear as well because if you can maintain or climb, obviously this is going to extend your glide. If you are in fact ascending, to maximize the ascent rate, you will fly minimum sink. Anytime the air is going up at least as fast as your Paraglider's Min. Sink rate, flying Min Sink will get you the furthest. You might notice that a pattern is developing here. In 0 lift you start off at Trim and progressively go to Min. Sink as the lift increases to match your gliders Min Sink speed. For any lift that exceeds your gliders Min Sink rate, you will go up the fastest at Min Sink speed. The faster you go up, the higher you will get and with height comes distance. This is true because of the shorter time you will be in the air as a result of the descending air. During this time, flying faster becomes more of a factor than how fast you are descending. This one is among the hardest to perceive, so you have to either use your vario to sense the amount of sink, or use the visual references. Starting at 0 lift/sink you fly trim. If your glider descends at 260 ft / Min at Best L/D (trim) and the sink cycle you are in is down at 240 feet / Min you will be descending at 500 ft / Min continuing to fly at trim. By flying faster you will descend a smaller percentage than the speed you increase. In all of these examples, it is simply a vector of whether speed or sink rate is going to help you glide the furthest. Application in the "Real World"
Most of the time there are blends of wind and lift/sink factors. You could encounter sink and a headwind at the same time. This is an easy one, as both tell you to speed up. The combination will lead you to fly faster. Contrarily, you could just as well fly into a thermal as you are penetrating a headwind. With this type of situation, you need to judge which factor is the dominant one. If the thermal in this situation is strong enough for you to maintain or climb a little near minimum sink speed and you are still moving forward, then the you would likely continue to fly near minimum sink speed (choosing that the lift is the stronger factor). But if the thermal is not so strong and the headwind is strong (at min sink you are not penetrating), then the wind is the stronger factor in this situation. It becomes pretty easy to pick the larger factor in the real world when you have ground references to check. Imagine that you are gliding toward an LZ that has trees around it including one at the far end. The top of the tree is in front of a contrasting field. As you glide toward your LZ, you can use the top of the tree to help you adjust your Speed to Fly. By referencing the relative motion of this tree top to the background, you can determine whether your glide will take you past the tree or not. If the top of the tree is moving up relative to the field, you will land short of the tree. 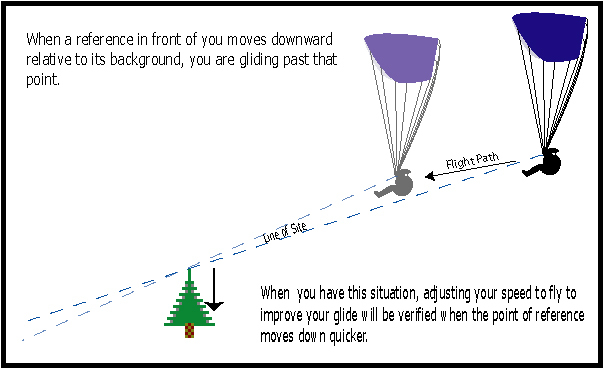 If the tree top is moving down relative to the field, your glide will carry you past the tree. If it is perfectly still against the background, your current glide will take you right to the tree top. How do you use reference points to adjust your Speed to Fly? In the simplest sense, you make adjustments to speed with the goal of improving your glide via the visual reference. If the tree is moving downward relative to the field, you will try to adjust your speed to maximize the tree moving downward, or, if the tree is moving upward relative to the field, you will make adjustments to minimize how fast it is going up. You can look in many directions and have different objects to cross reference against. In one direction it might be the top of a tree, in another the top of a ridge or mountain, in another a radio tower in the distance. You can even use other gliders in front of you if they are heading in the same direction. 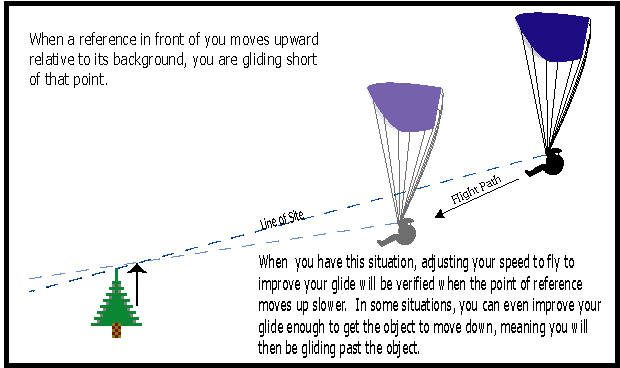 Although other gliders are not fixed, you can tell if you are improving your glide by adjusting the same way against them as for fixed objects. The point is that no matter what direction you are going there is almost always something to use as visual tool to help adjust your Speed to Fly (The main exception here is when you are way high over flatland or a lone mountain). Keep in mind that only references in front of you will work effectively, references to the side don't work (because you are not gliding toward them). Using a vario is another tool that can help you fine tune Speed to Fly. As stated above, if you can maintain or climb in lift, then min sink will be the correct Speed to Fly. On the contrary, if at min sink speed, you are descending, you should speed up a little. If you are sinking moderate to fast, then your best Speed to Fly will likely include some speed bar. All of the adjustments are a continual process and are never fixed. 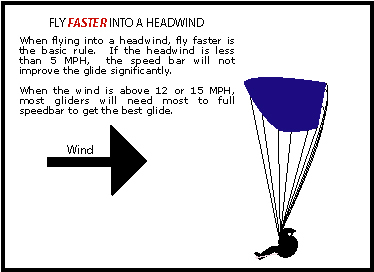 When the wind gusts, you need to adjust your speed (fly faster in a headwind) while flying through such a gust. As soon as the gust ends, you would readjust your speed. For each change in lift or sink, you will use the above 4 rules as an initial in seeking the right Speed to Fly. If a factor is prolonged and time permits, you can use any horizon reference to fine tune your adjustment. You can even use other gliders in front of you. The only hard and fast rule is that the reference should be in the direction you are heading. The first step in learning this is to begin combining your awareness of the basic adjustments. Then, you can begin to improve your relative glide by managing speed to fly with better understanding.